SRAM is Back! New RED eTap, New Electronic Eagle and New Capabilities With the launch of AXS, a group of connected components, SRAM's new wireless groups offer more than just 12speeds. Since the launch of RED eTap back in the summer of 2015, SRAM has been fairly quiet on the product front. So quiet in fact, that it felt as if eTap’s original promise of a wireless world went unfulfilled. It was released, and that was it. There were no updates allowing customization of shifting inputs or speeds, in fact there was not a single firmware update. Perhaps more importantly, there was no second tier Force eTap group to take advantage of all the buzz RED eTap created. But SRAM’s been busy, and they will remain silent no longer. SRAM RED eTap AXS is here, check out the bullet points below before the deep dive. 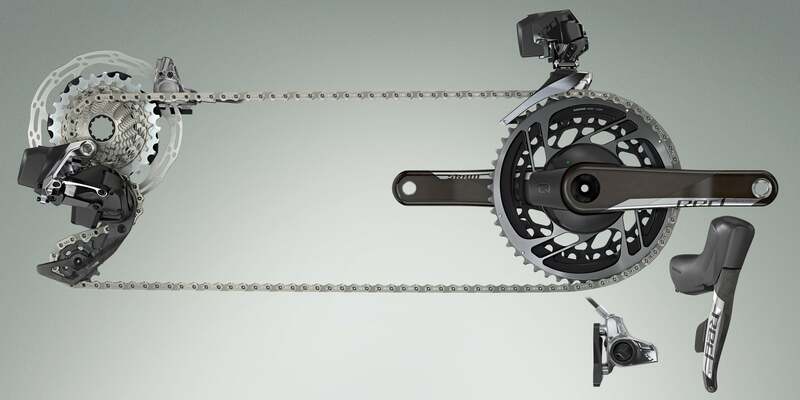 • SRAM Red eTap AXS wirelessly shifts a 12 speed cassette in a 2x or 1x configuration. • It’s part of a new AXS (say access) family that includes a new MTB Eagle AXS 1x group as well as a RockShox AXS dropper post and they all work together thanks to the AXS app. 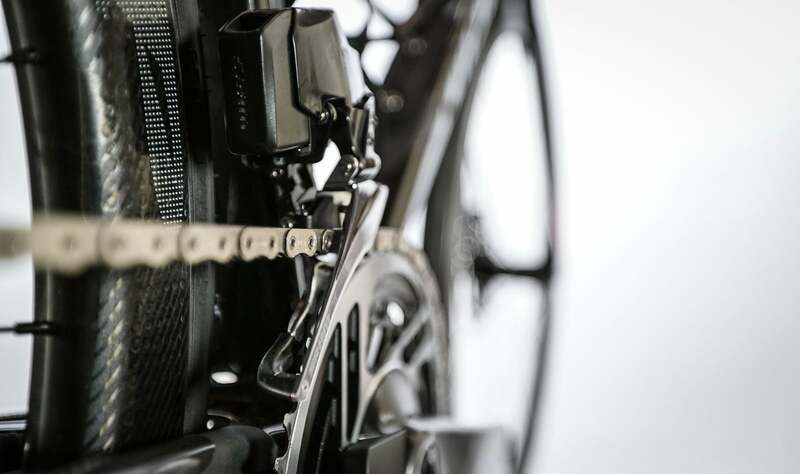 • SRAM RED eTap AXS uses its 12 cogs and 10t small cog to radically change ‘traditional’ road gears, offering more low range as well as more efficiency. It’s called X-Range. • A trick new fluid damper in the rear derailleur manages chain tension instead of a mechanical clutch. • Sorry, you’re going to need new wheels, or at least hub body. RED eTap uses a new XDR driver and the existing XD driver for Eagle. • It’s an electronic future for SRAM, while unofficial, we were told there is no mechanical 12 speed group in the works or even planned. • Here’s the big news: A SRAM Force eTap AXS group will launch in April. While the news that SRAM has finally updated eTap and built a family of interconnected, 12speed components that are customizable, will steal the limelight – and we’ll certainly cover that – the two biggest takeaways for PELOTON are the increased low end gears and the new fluid clutch in the rear derailleurs. 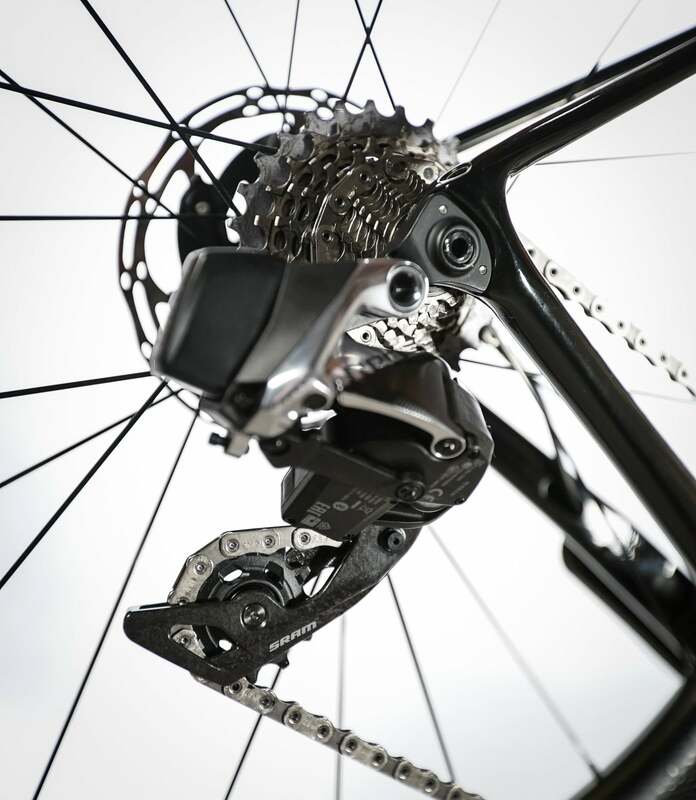 Where Campagnolo used 12speeds for faster shifting and more efficiency between the extremes, SRAM has used 12 speeds to deliver both increased speed and efficiency between extremes and much wider range, thanks to the 10speed cog enabled by the XDR driver. Yes, your old wheels are no good, but the payoff is pretty impressive. SRAM RED eTap AXS offers 10-26, 10-28 and 10-33 cassettes. While up front in 2x set ups, chain rings max out at just 50t, with a 50/37, 48/35 and 46/33 options. They results are quite incredible. In terms of old school gear inches, a 50×10 combo delivers a bigger gear – 131.5” – than a 53×11 combo – 126.76” – , while the 37×26 is lower than a 39×26 combo – 37.4” inches to 39.45” respectively. That’s more usable gear on both ends of the cassette, plus more efficiency in the middle, not to mention a 50t front ring allows you to stay in the big ring in more situations. 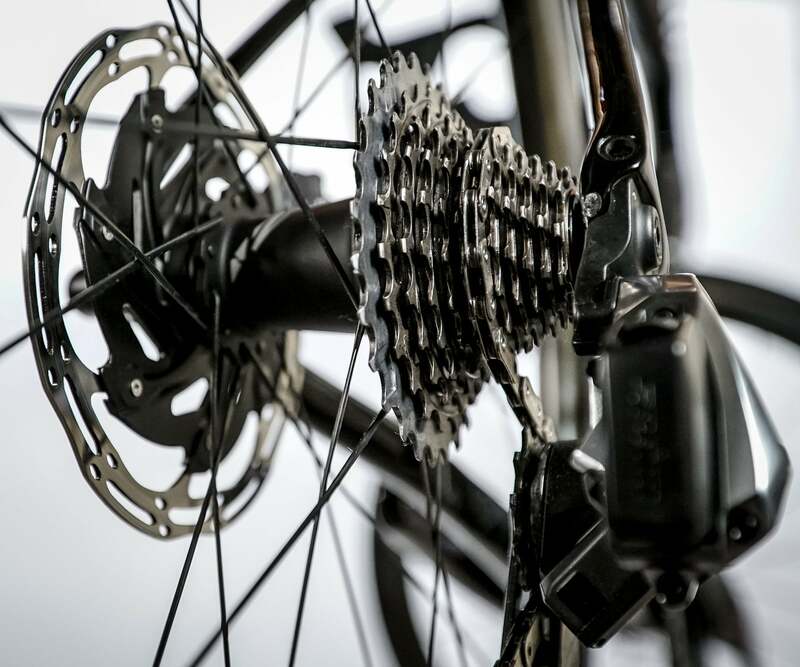 The same math holds true across all the new gear ratios for RED eTap AXS when compared to traditional cassettes, compacts and sub-compacts, with RED eTap AXS even offering a true 1×1 gear combo with the 46/33 rings and 10-33 cassettes. Plus, the front derailleur only ever has to move the chain across a 13t gap between chain rings. And let’s face it, SRAM does many things well, but the front derailleur has never been a highlight. 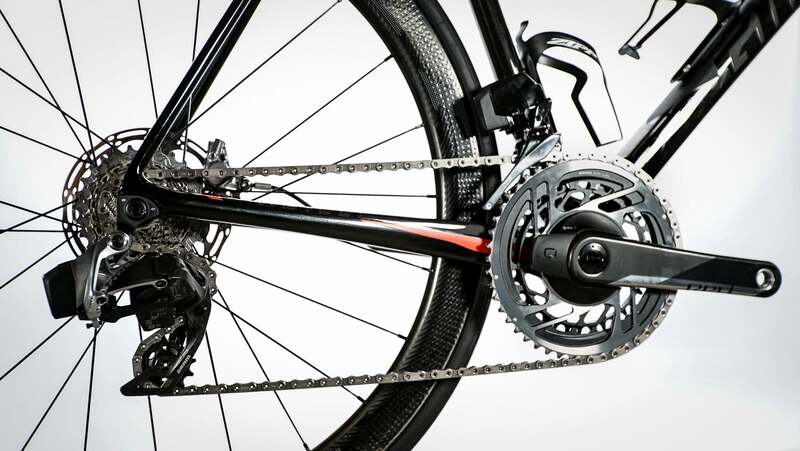 This combo of rings and derailleur looks to be the best SRAM has ever made. While a new app, customizable shifting and the other bright, shiny updates may get the most press, it’s these gear ranges that are the true innovation. These are gears that align with how and where we actually ride today. It’s going to allow riders to ditch some of the poor shifting ‘Frankenstien’ builds cobbled together to try and solve gear range problems. More about the subject when we get to new Eagle eTap. 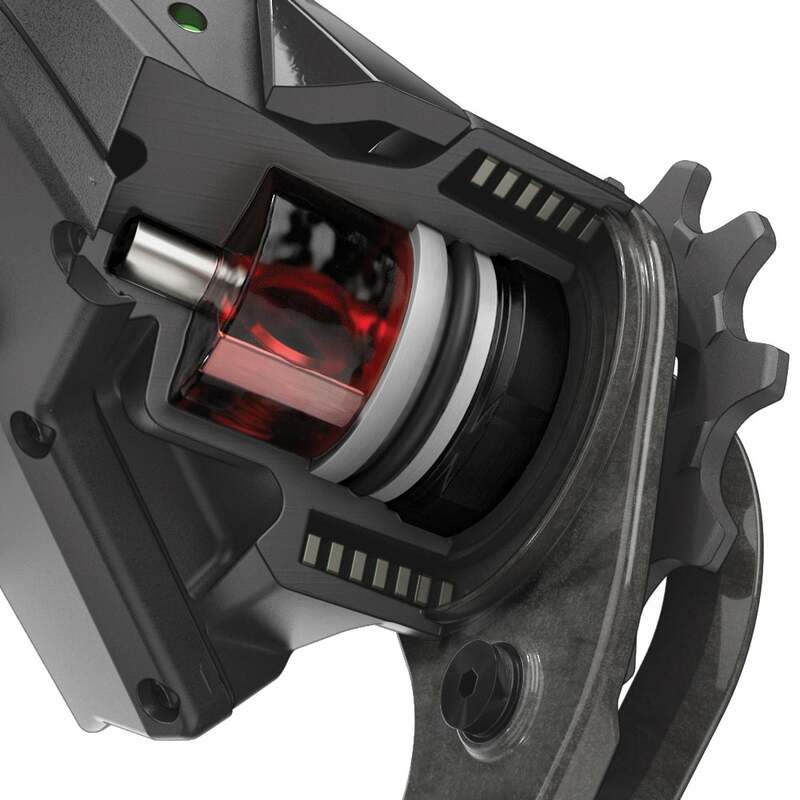 Our other favorite bit of tech is SRAM’s new fluid damper in the rear derailleur to manage chain tension. If SRAM’s going to give us gear range for more versatility, the rear derailleur better be up to it, and it is. Instead of the old spring loaded Cage Lock clutch on Force1 that had to be locked out to remove the wheel, this new fluid damper, called Orbit, does its job quietly in the background. A small fin or blade is sealed in a fluid reservoir –move the derailleur at its normal place and the blade moves through the fluid with little resistance, but hit a big pothole, or dirt rut, and as the chain tries to buck quickly off the front ring, the blade’s drag through the fluid stops the derailleur cage from moving, keeping tension on the chain and it seated securely on the ring. It’s so effective the new RED eTAP AXS rear derailleur can happily work in a 1x setup. Plus, it keeps the drive train extremely quiet. While a new application of the technology, fluid dampers are used in many other applications, like motorcycle steering dampers and even soft close cabinets and drawers. The system is totally closed and should work for years and years with no maintenance whatsoever. For good measure the new rear derailleur has a new motor and a new chip to run it, making it shift faster and more accurately than old RED eTap, which if anyone had a quibble with old eTap it usually came down to the speed of shifts being a tad slower than Di2. We’ll talk more about the speed of shifts below. The rear derailleur is the king of the system, using SRAM’s Airea signal to talk to the rest of the AXS components and Bluetooth and ANT+ to talk to head units and smart phones. While that’s a lot of communication protocols and sounds complex, it’s actually to create a seamless experience for the riders. Your components do it all in the background, speaking the language they need to when they need to. The new front derailleur seems very similar to the old eTap, using the trim less YAW design, but it was actually designed in conjunction with the new front rings. In the past SRAM engineers had to design chian rings for an existing derailleurs which was a challenge. Another major difference is tire clearance. The battery, still the same as the original eTap group, has been moved out board of the frame radically improving tire clearance. Where a 32mm tire was a stretch in many RED eTap frames before, the new front derailleur allows for a 42mm tire with a 700c wheel. To help limit chain rub, RED eTap AXS locks out the 10t cog when in the little ring. For comparison, Shimano Di2 locks out the two bottom cogs when in the little ring. AXS is a new app and the name that ties all of this together. The AXS app allows you to customize your shift inputs and patterns, lever inputs can be swapped, the amount of cogs selected with a lever hold, blips can be assigned whatever input you like, and now sequential shifting is possible as well as a compensating mode that will drop the cassette one or two cogs upon shifting into the little ring. The APP can also track the hours and shifts you’ve put in, helping track your bike’s maintenance. 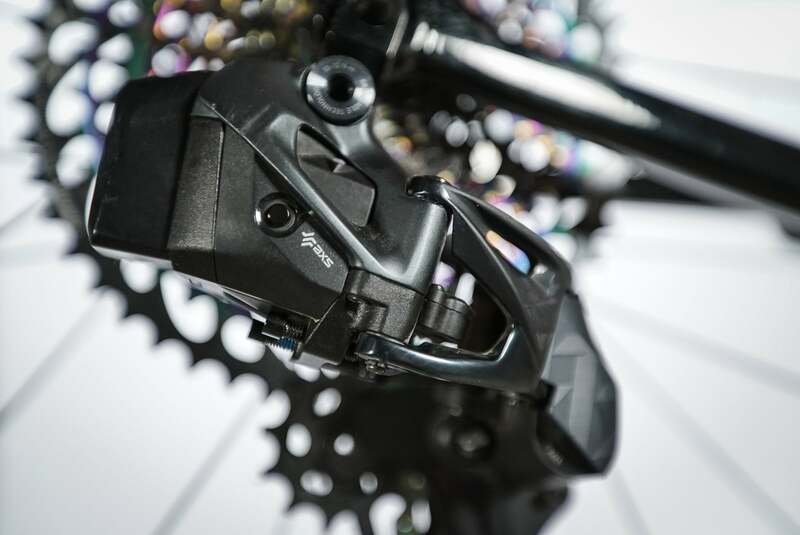 While this is new to SRAM, it’s certainly not new to electronic shifting, and SRAM is really just checking boxes here and delivering what riders now expect from an electronic system thanks to Shimano and Campagnolo. That’s not to say SRAM copied those brands. In fact, it found little to emulate with the user experience, instead looking to things like car media systems and Nest home control units. Even though eTap still communicates with SRAM’s original Airea protocol, 11spd eTap levers cannot be used with new AXS components. If it doesn’t say AXS, it won’t work in the family. There is one customization, however, SRAM did not deliver with AXS, unlike Di2, the speed with which your bike shifts cannot be changed. This is essentially because SRAM has made RED shift as fast as it possibly can, and who wants a slower shift, right? Since depressing both levers at once initiates a front shift, the system has to wait a fraction of a second after one lever is pressed to see if it detects a second quick press for a front change. If it does not, it shifts the rear derailleur. There is no question new RED eTap shifts faster than old eTap, thanks in part to the narrower chain and the cogs placed closer together, and in 1x configurations where it doesn’t need to wait for a front shift signal, the system is even faster. As long as a front derailleur is not paired into the group, the rear derailleur knows to shift faster. Presumably if a RockShox AXS dropper post were used in 1x set up and the dual lever press was set up to activate the dropper, then rear shifting would slow a hair to that of a 2x AXS set up. AXS components will display the same information old eTap did with head units – gear selection, number of shifts, and battery status. Expect 60 hours of run time out of a new RED eTap AXS group, with the same battery level indicator lights – green above 25%, red when below 25% life and flashing red below 15% and it will fully charge in one hour. The entire AXS system also uses the same battery as original RED eTap. It’s important to note that as useful as the AXS app can be, it is totally unnecessary to ride the bike. If you just want to ride with the usual shift logic, you never need to open, or even download the app. If your bike is set for sequential shifting, you can even turn that on and off without the AXS app, with the AXS button the back of the levers. The Chain, the Cranks and all the Other Bits . . . 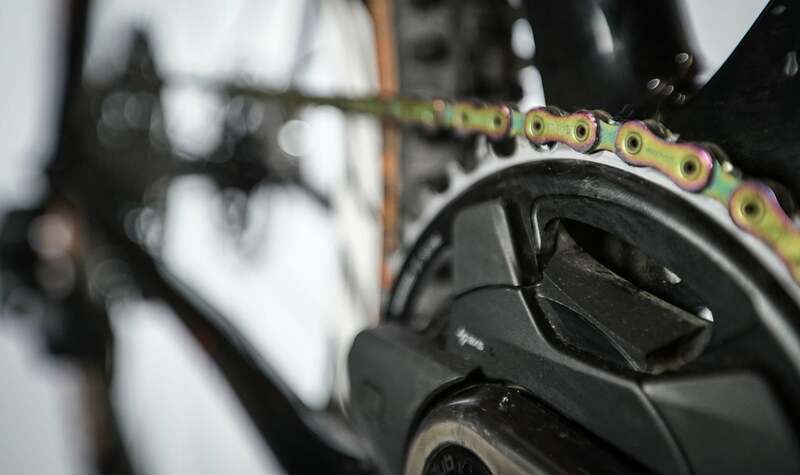 The new chain is thinner to accommodate the thinner cogs and chain rings, but is also billed as SRAM’s toughest and longest lasting chain, how? SRAM calls it FlatTop and has added material to the plate’s outer edge, eliminating the traditional figure eight look. 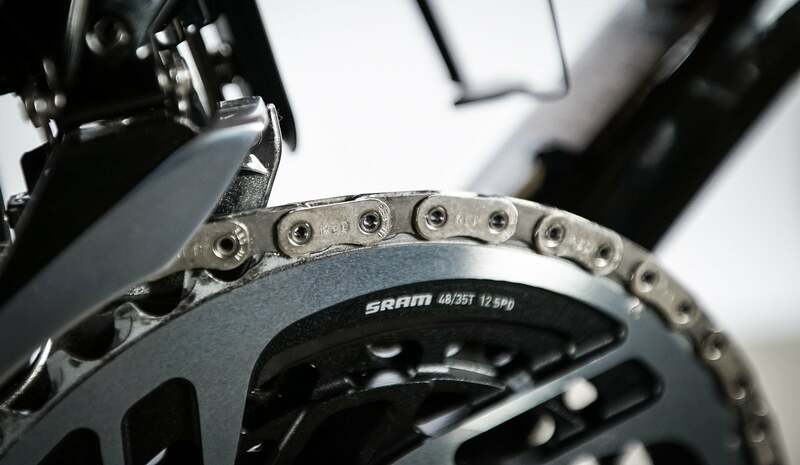 While it’s a very cool looking piece of equipment, SRAM’s quick to point out the industrial design team gets zero input on the chain, it’s all function. While SRAM recommends a Park Tool CT-3.3 chain tool, most other chain tools seem to work. We already covered the new chain ring configurations above, but there are some other interesting facts about the new cranks. In addition to the 2x set ups there are 1x rings – 36, 38, 40, 42, 44, 46 – and those include the spider and ring. Two rings for 1x aero set ups are offered, 48 and 50, and those are eight bolt direct mount rings. For the most part, these new cranks use SRAM’s new DUB bottom bracket, but Italian threaded BB’s will need to use a new GXP variant of the RED eTap AXS cranks as will Trek BB90 bikes. A word about the available, integrated Quarq Power Meter. 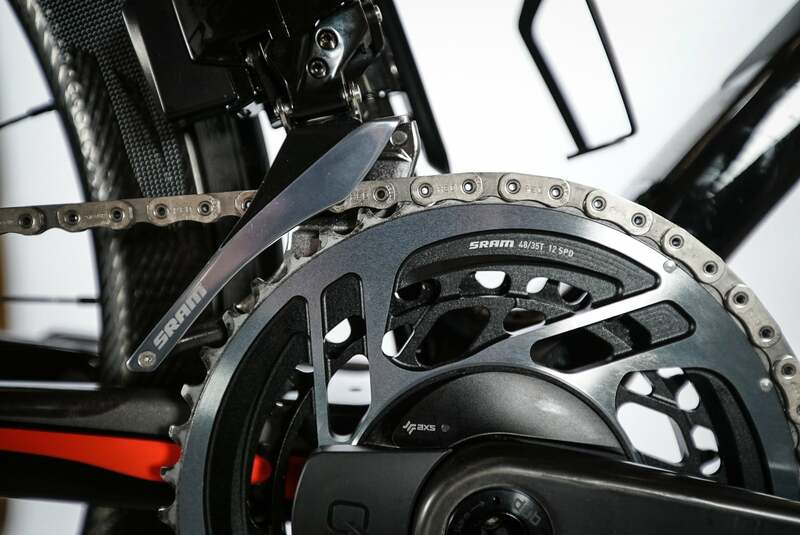 It is so integrated into the chainrings for light weight and accuracy that when the chainrings wear out, the power meter – potentially fully operational – is also tossed out. SRAM claims a 50% increase in chainring life vs original RED, so depending on your riding style, mileage and climate it could potentially be time for a bike upgrade anyway. Even if it’s not, SRAM has you covered in with a Power Meter Support Program. When it’s time to replace a SRAM RED eTap AXS integrated power meter and chainrings assembly, riders can contact SRAM for a half-price replacement, and SRAM will recycle the old one. As mentioned earlier, the 12speed cassette now requires a new XDR driver. All three available cassettes start with the 10t cog and the max cog is 33, which is also the max cog the new derailleur will accept and there is no WiFLi long cage option. The cassette continues to use the rubber ‘Stealth Rings’ between cogs, which combine with the new fluid damper to create what might be the quietest group in the peloton. The rest of the parts that make up SRAM RED eTap AXS are essentially unchanged. The hydraulic brakes are the same HRD system as old RED and there are also rim brake levers if you want to ride like it’s 1999. 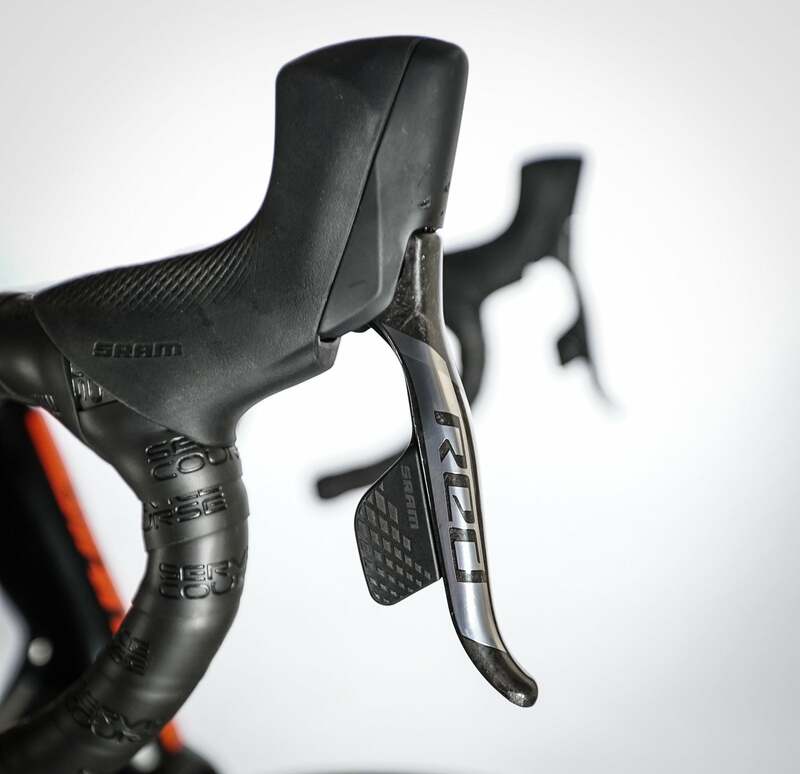 The lever’s rim and disc, are the same shape and ergonomics as the original eTap levers, just with some new hood and paddle texture and chrome graphics. What’s Up with Eagle eTap AXS? 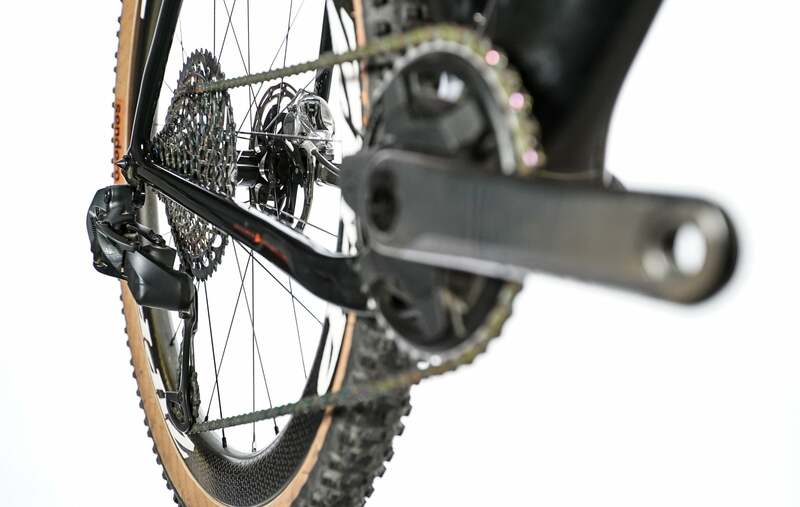 Eagle, SRAM’s 1×12 mechanical MTB group, has gotten the AXS treatment. That means as part of an AXS group you could get an electronic shifting 1×12 group with a massive 10-50 cassette. While AXS parts are quite interchangeable, there are limits. If you want the 10-50 cassette, you’ll need the longer cage Eagle AXS derailleur, the Eagle AXS chain and wheels with a XD driver. RED eTap AXS chains, rear derailleurs and XDR drivers are not compatible with the Eagle AXS cassette. But, RED levers and cranks are, as is the new Rockshox AXS dropper post. With a single ring up front, the AXS app could be used to customize a double lever tap to initiate the dropper, or a single Blip under the bar tape. This compatibility really does away with the need for the ‘Frankenstien’ builds we mentioned earlier, making drop bar bikes with massive capability a native talent of SRAM’s AXS family. Both RED eTap AXS and Eagle AXS are available now – in both the aftermarket and on numerous builds, from Trek to Specialized and Pinarello to GIANT. Look for more details very soon about the upcoming Force eTap AXS group in April. For more info and details head to SRAM.com.